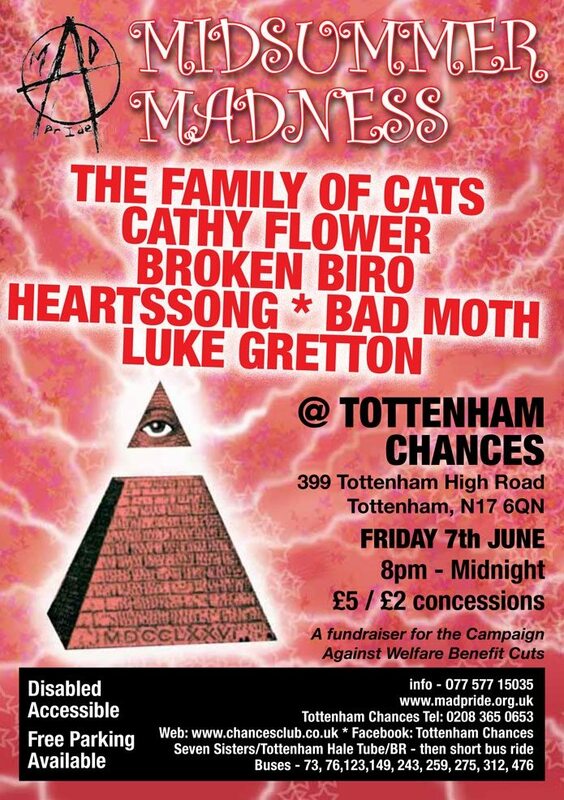 Yes folks, Mad Pride Midsummer Madness is on Friday 7th of June 2013 – 8pm till late. The Family of Cats collective are a very tuneful and accessible combo who play a varied set from slow moody lilting ballads to rousing jazzy, Latin, Lounge and “psychedelic funk”. They can sing! I mean really sing – and the musicianship is what I think they would call “sophisticated”. Fronted by songsmith’s Josh and Sarah, and backed by harmonium among others, Mad Pride is pleased and proud to have them come down. For those who missed Bad Moth at a recent Mad Pride soiree, this unique duo are back. Stanley Bad and St Moth will be delivering their astounding blend of opera, gypsy jazz, East End music hall and Zappaesque Byzantine tunes. They will be nothing if not unpredictable. Prepare to gawp open-mouthed. Also we welcome the Australian poet Cathy Flower, comedy stylings of Luke Gretton, Broken Biro and an acoustic set from folk songstress HeartsSong. Also added is Jazzman John Clarke! Another feast from Tottenham Chances, the friendliest and cheapest venue in North London.